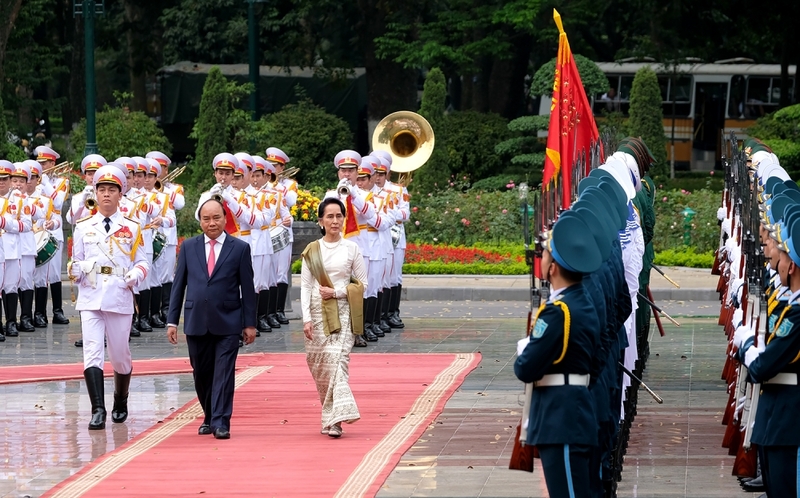 (VEN) - At the invitation of Vietnamese Prime Minister Nguyen Xuan Phuc, Myanmar’s State Counselor and Foreign Affairs Minister Aung San Suu Kyi visited Vietnam from April 19-20. The visit contributed to deepening the relations between the two countries. In the framework of the visit, State Counselor Aung San Suu Kyi held talks with Prime Minister Phuc; paid a courtesy call on Vietnam Communist Party General Secretary Nguyen Phu Trong; and met National Assembly Chairwoman Nguyen Thi Kim Ngan. The two sides issued a joint statement saying they had agreed to further increase political and diplomatic cooperation by boosting visits and contacts at different levels between party, government, state, national assembly officials, as well as people-to-people exchanges. They would also promote preparations for the ninth session of the Vietnam-Myanmar Joint Committee; and adopt as soon as possible an action plan to promote a comprehensive partnership in the 2018-2023 period, laying the foundation for substantial and effective cooperation. The two sides pledged to deepen trade and investment relations for mutual benefit; increase cooperation and strive to raise bilateral trade to US$1 billion or higher levels. Both sides wish to boost cooperation in other important areas, such as finance, telecommunications, energy, agriculture, forestry and fisheries, as well as people-to-people exchanges. The two sides agreed to further promote cooperation in transportation, tourism, justice, education and culture; and sign agreements to boost cooperation in specific areas. Trade between the two countries reached nearly US$830 million in 2017, a rise of 51 percent compared with 2016, exceeding the US$500 million target set for the year. 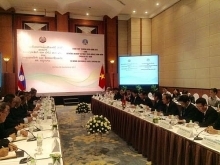 Vietnam has become Myanmar’s ninth largest trading partner. The turnaround in bilateral trade occurred in 2012. Prior to that, Vietnam faced a continuous trade deficit with Myanmar, but in 2012, it recorded a surplus of US$8.3 million in exchange of goods with this market for the first time. Statistics show satisfactory annual growth of bilateral trade, which increased from 27.3 percent in the 2010-2016 period to 51 percent in 2017 compared with 2016. Myanmar moved up 12 places, from the 55th position among Vietnam’s trading partners in 2010 to 43rd in 2017. The two countries have maintained coordination in organizing annual trade fairs to present their products and attract investment. Vietnam currently is Myanmar’s seventh largest foreign investor, with 17 projects totaling registered capital of US$2.1 billion, accounting for 2.8 percent of total foreign investment in Myanmar. The most notable Vietnamese investment project in Myanmar is a joint-venture telecommunications project with total capital of more than US$1.38 billion, 49 percent of it by Viettel. The project has contributed to taking Vietnam from the 10th position to the seventh among 49 countries and territories investing in Myanmar. In December 2017, Vietnam had more than 196 commercial representations in Myanmar, including representative offices, company branches, joint-venture companies and companies with 100 percent Vietnamese capital. Prime Minister Nguyen Xuan Phuc and Myanmar’s State Counselor Aung San Suu Kyi witnessed the signing of two memorandums of understanding on postal, telecommunications, information technology and communications cooperation between the two countries.